The ultimate backhoe software. Breathtaking real-time 3D graphics keep operators precise and on target. Everything you need to perform hydrographic surveys to support your dredging operations. We design, manufacture, install and support dredge monitoring systems and software all over the world. 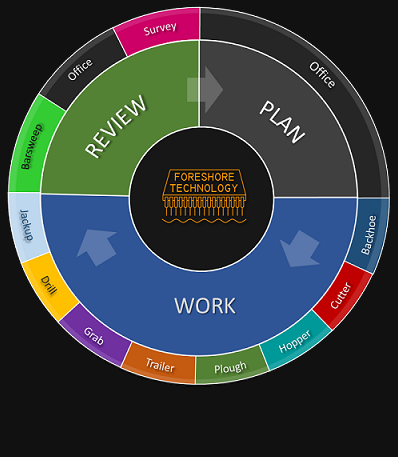 Foreshore Technology provide a suite of products to cater for every stage of a dredging project, from project planning to work monitoring to reporting. Use Dredge Master Office to create your projects, load survey data and drawings and configure the geodetic parameters. Share project data across all of our products. 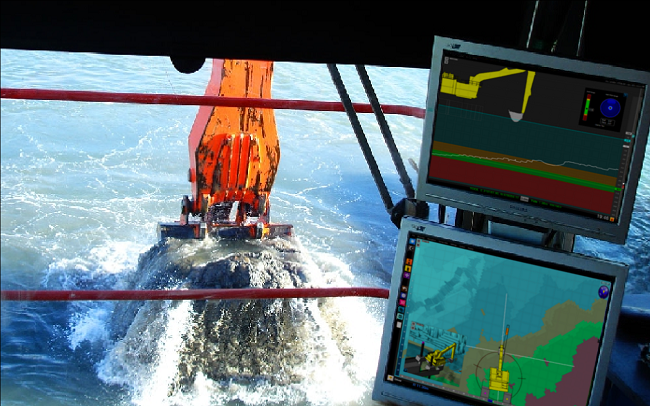 Use the real time displays and operator friendly symbols to monitor your dredging progress. Check your work using the barsweep or Hydrographic survey applications. Report on stoppages and vessel movements to prepare for client meetings. OFFICE Software planning tool — offline preparation — for the project manager — blend your AutoCAD charts, engineering design and bathymetry to create design templates and cutplans — production and statistical analysis — spot trends in efficiency and feedback — bench mark against multibeam survey data — replay production patterns graphically. PLOUGH Manage your plough and bed levelling operations — efficiently and systematically move material to your dredges — manually set plough depths or automate. SPLIT HOPPER Manage your disposal at sea operations — log your vessel positions — dump logs with position and time — controlled by vessel crew or black box technology. BARSWEEP Plot and record your barsweep survey. JACKUP Position your jackup fast and accurately so platform operations can continue efficiently with minimal disruption. LAND BACKHOE Terrestrial version of the ground breaking dredging software. LAND DOZER Whether in support of your dredging operations or complete standalone land work use Land Backhoe and Land Dozer to real time monitor your ground work operations.